By Nicholas D. Cowie, Esq. In a recent opinion, The Milton Company v. Council of Unit Owners of Bentley Place Condominium (the “Bentley case,”) Maryland’s highest appellate court made a number of important rulings concerning the legal authority of a council of unit owners (“council”” to sue on behalf of its unit owner members with regard to construction defects. The Bentley case involved a suit brought by the Council of Unit Owners of Bentley Place Condominium (the “Council,”) against a developer and builder for construction defects in the common areas and the individual units of Bentley Place Condominium. The Council filed suit on its own behalf and on behalf of “two or more unit owner.” Following a four-week trial, the jury returned verdicts in favor of the Council, awarding approximately $6,600,000.00 in damages. The developer and builder appealed. 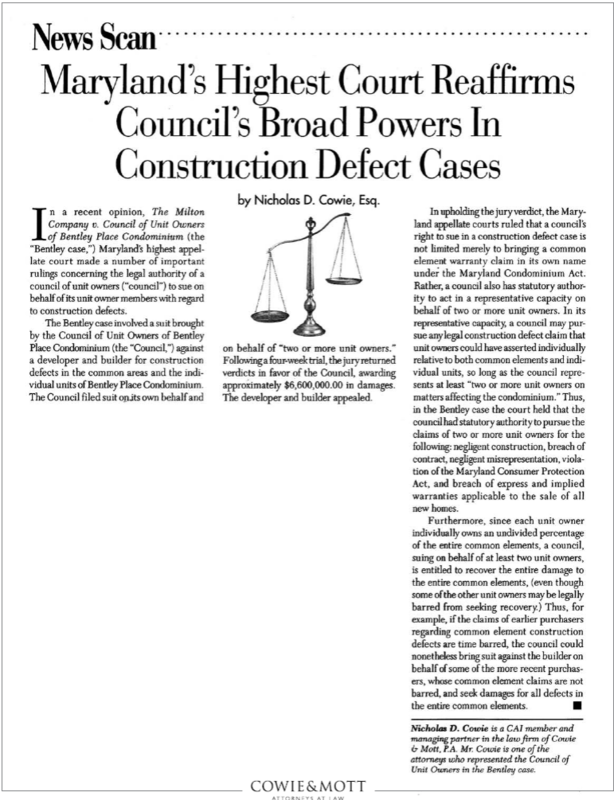 In upholding the jury verdict, the Maryland appellate courts ruled that a council’s right to sue in a construction defect case is not limited merely to brining a common element warranty claim in its own name under the Maryland Condominium Act. Rather, a council also has a statutory authority to act in a representative capacity on behalf of two or more unit owners. In its representative capacity, a council may pursue any legal construction defect claim that unit owners could have asserted individually relative to both common elements and individual units, so long as the council represents at least “two or more unit owners on matters affecting the condominium.” Thus, in the Bentley case the court held that the council had statutory authority to pursue the claims of two or more unit owners for the following: negligent construction, breach of contract, negligent misreorientation, violation of the Maryland Consumer Protection Act, and breach of express and implied warranties applicable to the sale of all new homes. Furthermore, since each unit owner individually owns an undivided percentage of the entire common elements, a council, suing on behalf of at least two unit owners, is entitled to recover the entire damage to the entire common elements, (even though some of the other unit owners may be legally barred from seeking recovery.) Thus, for example, if the claims of earlier purchasers regarding common element construction defects are time barred, the council could nonetheless bring suit against the builder on behalf of some of the more recent purchasers, whose common element claims are not barred, and seek damages for all defects in the entire common elements. Nicholas D. Cowie is a Maryland construction lawyer and construction defect attorney with the Maryland construction law firm of Cowie & Mott, P.A. Mr. Cowie is one of the Maryland construction attorneys who represented the Council of Unit Owners in the Bentley case.